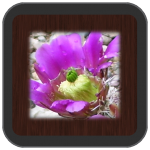 PhotoKiosk turns your iPad or iPad 2 into a gorgeous kiosk, displaying photos from an unlimited number of Flickr photo feeds or compatible URLs. Also works with the iPhone and iPod Touch. A password-protected setup screen allows you to add feeds using an individual ID, a group ID, tags, the public feed, or a custom feed URL, or any combination. Feeds can be easily switched on or off, and a description of each feed can be optionally displayed on the kiosk. Feeds are automatically cycled based on the refresh time you set, and the number of photos to display can also be changed. Touch a photo to zoom in, triple tap the screen to access the settings (after also entering your password), or quadruple tap to refresh the page and move to the next feed. Older pictures are smaller and/or more transparent, while the newest pictures show up larger and opaque. Tap any picture to zoom in to the fullest size possible. Works in either landscape or portrait mode and automatically compensates when you rotate the iPad. Use it in conjunction with iPad kiosk hardware that hides the Home button to turn it into a photo display for trade shows, non-profits or other businesses. Updated to version 1.2 – fixed a bug introduced by a Flickr API call change. Also removed the interruptive error messaging.